"This tastes like the salad that is served at a famous Italian restaurant chain in my area. It's perfect with fresh loaf of crusty bread. For the best flavor be sure to use fresh whole-milk mozzarella it puts the packaged varieties to shame. You can find fresh mozzarella in Italian delis, gourmet markets, cheese shops and some grocery stores." In a large bowl, combine the tomatoes, cheese, onion, oil, vinegar, basil, and salt and pepper to taste. Toss and chill for 1 hour. Serve on large platter. Ripe tomatoes and top-quality mozzarella and olive oil make the difference. The flavor was great, but I think I'll stick with Bruschetta, it's easier to eat. So Good!!! Using fresh picked tomatoes and basil from our garden really make this dish. A summer long favorite at lunch or dinner. 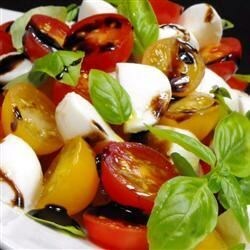 Use fresh ingredients...especially the mozzerella, and seed the tomatoes so it's not a wet mess. This was a great salad. I messed up and got shredded mozzarella without thinking, but it still turned out great! Rave reviews all around! Extremely easy and very tasty. A nice side dish for a bacon-wrapped filet mignon. Thank you for sharing it. Loved this! Easy Fast and Yummy! Great, simple recipe - perfect in the Summer with grilled steaks or for a light lunch!